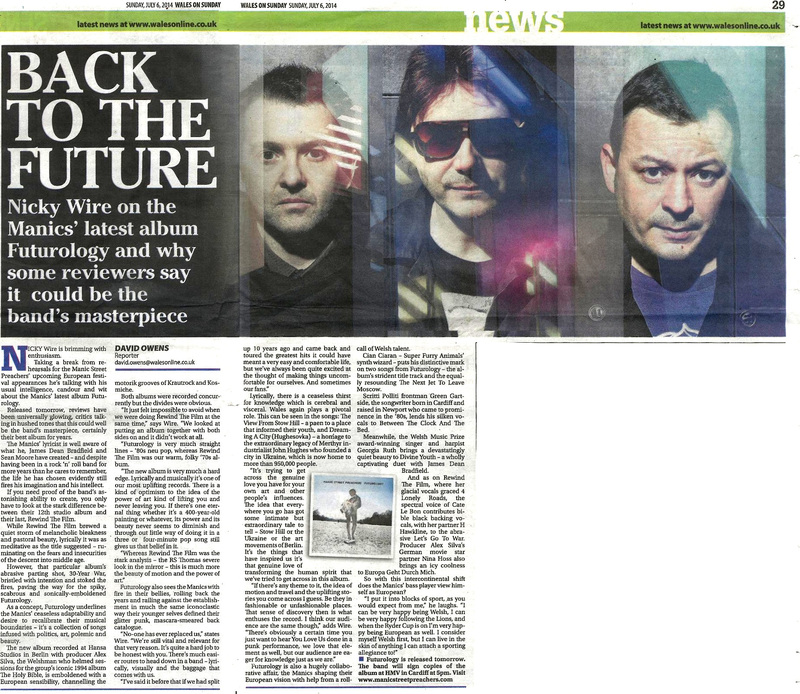 Nicky Wire on the Manics' latest album Futurology and why some reviewers say it could be be the band's masterpiece. Nicky Wire is brimming with enthusiasm. Taking a break from rehearsals for the Manic Street Preachers' upcoming European festival appearances he's talking with his usual intelligence, candour and wit about the Manics' latest album Futurology. Released tomorrow, reviews have been universally glowing, critics talking in hushed tones that this could well be the band's masterpiece, certainly their best album for years. The Manics' lyricist is well aware of what he, James Dean Bradfield and Sean Moore have created - and despite having been in a rock 'n' roll band for more years than he cares to remember, the life he has chosen evidently still fires his imagination and his intellect. If you need proof of the band's astonishing ability to create, you only have to look at the stark difference between their 12th studio album and their last, Rewind The Film. While Rewind The Film brewed a quiet storm of melancholic bleakness and pastoral beauty, lyrically it was as meditative as the title suggested - ruminating on the fears and insecurities of the descent into middle age. However, that particular album's abrasive parting shot, 30-Year War, bristled with intention and stoked the fires, paving the way for the spiky, scabrous and sonically-emboldened Futurology. As a concept, Futurology underlines the Manics' ceaseless adaptability and desire to recalibrate their musical boundaries - it's a collection of songs infused with politics, art, polemic and beauty. The new album recorded at Hansa Studios in Berlin with producer Alex Silva, the Welshman who helmed sessions for the group's iconic 1994 album The Holy Bible, is emboldened with a European sensibility, channelling the motorik grooves of Krautrock and Kosmiche. Both albums were recorded concurrently but the divides were obvious. "It just felt impossible to avoid when we were doing Rewind The Film at the same time," says Wire. "We looked at putting an album together with both sides on and it didn't work at all. "Futurology is very much straight lines - '80s neu pop, whereas Rewind The Film was our warm, folky '70s album. "The new album is very much a hard edge. Lyrically and musically it's one of our most uplifting records. There is a kind of optimism to the idea of the power of art kind of lifting you and never leaving you. If there's one eternal thing whether it's a 400-year-old painting or whatever, its power and its beauty never seems to diminish and through out little way of doing it in a three or four-minute pop song still gives us that belief in it. "Whereas Rewind The Film was the stark analysis - the RS Thomas severe look in the mirror - this is much more the beauty of motion and the power of art." Futurology also sees the Manics with fire in their bellies, rolling back the years and railing against the establishment in much the same iconoclastic way their younger selves defined their glitter punk, mascara-smeared back catalogue. "No-one has ever replaced us," states Wire. "We're still vital and relevant for that very reason. It's quite a hard job to be honest with you. There's much easier routes to head down in a band - lyrically, visually and the baggage that comes with us. "I've said it before that if we had split up 10 years ago and came back and toured the greatest hits it could have meant a very easy and comfortable life, but we've always been quite excited at the thought of making things uncomfortable for ourselves. And sometimes our fans." " Lyrically, there is a ceaseless thirst for knowledge which is cerebral and visceral. Wales again plays a pivotal role.is can be seen in the songs: e View From Stow Hill - a paen to a place that informed their youth, and Dreaming A City (Hughesovka) - a homage to the extraordinary legacy of Merthyr industrialist John Hughes who founded a city in Ukraine, which is now home to more than 950,000 people. "It's trying to get across the genuine love you have for your own art and other people's influences. -where you go has got some intimate but extraordinary tale to tell - Stow Hill or the "It's trying to get across the genuine love you have for your own art and other people's influences. e idea that everywhere you go has got some intimate but extraordinary tale to tell - Stow Hill or the Ukraine or the art movements of Berlin. It's the things that have inspired us it's that genuine love of transforming the human spirit that we've tried to get across in this album. "If there's any theme to it, the idea of motion and travel and the uplifting stories you come across I guess. Be they in fashionable or unfashionable places. at sense of discovery then is what enthuses the record. I think our audience are the same though," adds Wire. "ere's obviously a certain time you just want to hear You Love Us done in a punk performance, we love that element as well, but our audience are eager for knowledge just as we are." "Futurology is also a hugely collaborative -air, the Manics shaping their European vision with help from a rollcall of Welsh talent. Cian Ciaran - Super Furry Animals' synth wizard - puts his distinctive mark on two songs from Futurology - the album's strident title track and the equally resounding e Next Jet To Leave Moscow. Scritti Polliti frontman Green Gartside, the songwriter born in Cardiff- and raised in Newport who came to prominence in the '80s, lends his silken vocals to Between e Clock And e Bed. Meanwhile, the Welsh Music Prize award-winning singer and harpist Georgia Ruth brings a devastatingly quiet beauty to Divine Youth - a wholly captivating duet with James Dean Bradfield. And as on Rewind e Film, where her glacial vocals graced 4 Lonely Roads, the spectral voice of Cate Le Bon contributes bible black backing vocals, with her partner H Hawkline, to the abrasive Let's Go To War. Producer Alex Silva's German movie star partner Nina Hoss also brings an icy coolness to Europa Geht Durch Mich. So with this intercontinental shift does the Manics' bass player view himself as European? "I put it into blocks of sport, as you would expect from me," he laughs. "I can be very happy being Welsh, I can be very happy following the Lions, and when the Ryder Cup is on I'm very happy being European as well. I consider myself Welsh first, but I can live in the skin of anything I can attach a sporting allegiance to!" This page was last modified on 26 November 2018, at 20:03.